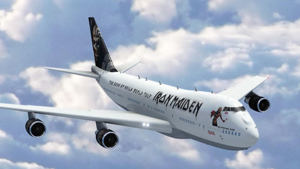 IRON MAIDEN, whose new studio album The Book Of Souls, their first in 5 years, will be released worldwide next week on Sept 4, are taking touring to a new level using a Boeing 747-400 Jumbo Jet (aka Queen of the Skies) for their World Tour next year. Vocalist Bruce Dickinson is currently in training for his licence to fly the massive four engine jet, which is almost twice the size and over three times the weight of the Boeing 757 used on previous tours in 2008/9/11. The new Ed Force One will take the band, crew and over 12 tons of equipment more than 55,000 miles (88,500km) around the planet with concerts in six of the seven continents (Australasia, Asia, North and South America, Africa and Europe) with The Book of Souls World Tour 2016 expected to visit around 35 countries. Details of the precise schedule are currently being finalized and we will commence announcements of specific dates for the different territories in a few weeks’ time. However we can reveal that The Book Of Souls World Tour will open in the U.S.A in late February with Ed Force One flying in for three shows before, in early March, heading into Central America visiting MEXICO, followed by a much anticipated first ever concert in EL SALVADOR and a return to COSTA RICA. Ed Force One then proceeds into South America for concerts in ARGENTINA, CHILE and a number of shows in BRAZIL before flying back to the USA at the end of March for ten more cities covering the U.S.A and, of course, CANADA in the first two weeks of April. “When the opportunity arose from my friends at Air Atlanta Icelandic (www.atlanta.is) to lease a 747 for The Book of Souls World Tour, of course we jumped at the chance, who wouldn’t? The greatest benefit of travelling in a 747 is that because of its colossal size and freight capacity we can carry our stage production and all our stage equipment and desks in the cargo hold without having to make any of the immense structural modifications needed to do this on the previous 757, the extent of which fans will have noted on the Flight 666 DVD. Although in reality we cannot carry much more gear the savings in complexity, time and cost make using the 747 even more practical. All we will need to do is “paint” it and move a few seats around, with the added advantage that there is much more room for band and crew – our Krew can almost get a row of seats each to catch up on sleep on the flights! Furthermore, it is marginally faster o.85 MACH and the range of around 7000NM (13,000 km) is much greater which means we will not have to make the refuelling stops we needed to with the 757. The 747 is the world’s most recognizable airliner on account of its distinctive hump. With its impressive dimensions of 70.7m (232ft) length, 19.4m (63.6ft) height and a jaw-dropping wing span of 64.4m (211ft) this double-decker aircraft has a range of 13,450km (7,262nm). The Book Of Souls is MAIDEN’s 16th, and first ever, double studio album and is released September 4 through BMG in the U.S.A (Parlophone Records rest of world).